If you are a small business owner and believe that a corporate wellness plan would be valuable, but you’re just not sure how to implement any changes for your employees, read on! Wellworks For You believes that companies of all shapes and sizes can benefit from wellness programs. Don’t let the word “corporate” fool you. The ideas and goals of any successful plan can be applied to small businesses too and offer a world of benefits to individual employees and to entire companies. Can A Corporate Wellness Plan Help Your Small Business? Obviously these results benefit everyone involved and are worth the effort it takes to make a few changes around the workplace. To get started, check out the tips below and remember your efforts don’t need to stop here! There are so many creative ways to increase your employees’ overall wellness. 1. Use pedometers! This easy step can challenge and encourage employees to increase their fitness levels, lose weight, and be more active. 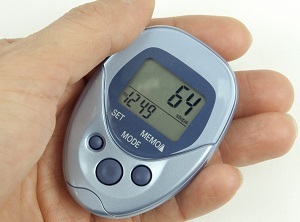 Encourage employees to wear the pedometer at work and at home and keep track of their daily steps. Starting a little friendly competition is a great way to get more people interested and on board. Offering a small reward for the winner is not difficult and can keep spirits up during the challenge! 2. Provide health risk assessments. Allow any interested employees the opportunity to better understand their current state of health and realize any potential dangers of disease or injury. These assessments are easy to fill out and provide extremely beneficial information to users. They could end up helping someone make an important lifestyle change or encourage an employee to get a health concern checked out that he or she has been putting off or never even thought of. 3. Educate your employees. This easily implemented step is a major part of corporate wellness plans. Find interesting and useful facts and figures about health related issues to share with employees on a regular basis. Things like fast food nutritional value charts, work out ideas, etc. can all help encourage your staff to be more aware of their choices and how they affect their health.